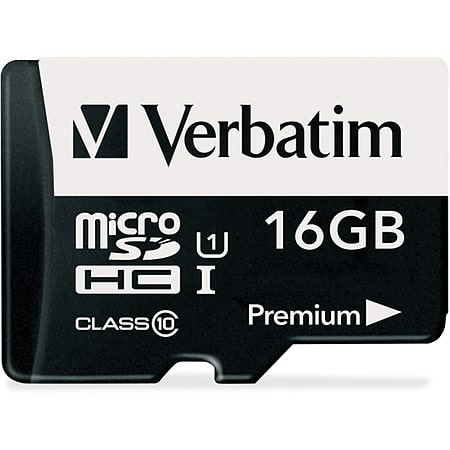 Verbatim Premium microSDHC memory cards are an ideal pairing for smartphones and tablets equipped with a microSD slot. Simply insert the card into the slot and you have the ability to store photos or record video directly to the card - saving valuable space on your mobile device for apps, music and more. Capture full 1080p HD video and richly detailed photography thanks to a UHS-I interface and U1 speed rating. Additionally, you can back-up files from your internal memory on your smartphone/tablet to the memory card, and with an SD adapter, quickly transfer content (up to 30MB/s read speed) to any SD compatible device like your laptop or home computer. Designed to keep your memories safe, Verbatim microSDHC memory cards are waterproof, shockproof and temperature proof - backed by a Limited Lifetime Warranty, they're technology you can trust.